The founder of St. Ansgar, the Rev. Claus Lauritz Clausen, 1820-1892, was born and educated in Denmark. As he reached maturity he decided to dedicate his life in the service of the church, choosing missionary work as his special field. In 1841 he went to Norway where his association with influential Lutheran leaders led him to accept a call from Muskego, Wisconsin, to come to America to preach the Word of God and promote the spiritual life of the Norwegian immigrants who were without well trained religious leaders. The Muskego settlers were willing to share their minister with many who had none, so Rev. Clausen traveled to many settlements in Wisconsin where he preached and administered the sacraments. The immigrants openly expressed their joy and gratitude for these pastoral services. Rev. Clausen's second call was to Rock Prairie (Luther Valley), Wisconsin. It was from there that, in 1853, he led a group of his parishioners to the site in Iowa which he called St. Ansgar in honor of the missionary who, in the 9th century, had converted the Scandinavian countries to Christianity. Rev. Clausen was a man of strong character, genial disposition, and many talents. Few men among the immigrant leaders of his day caught the true meaning of the word "service" as did Clausen. Although he was for several years the only Lutheran clergyman in that area it was quite natural for the people to look to him for guidance, help, and leadership in secular matters as well as in spiritual realm. These Norwegian immigrants were strangers to the American way of life, unfamiliar with the English language, and were in need of almost constant advice and help in business matters. Rev. Clausen was well qualified to give these immigrants the necessary aid. Historians say that St. Ansgar was the center of dispersion for a region that became the home of thousands of Norwegian immigrants down through the years. Although he was the pastor for the St. Ansgar congregation he did not forget the spiritual needs of those immigrants who scattered from this focal point. Besides founding twenty-one sister congregations of the St. Ansgar congregation he continued for years to make missionary trips throughout a territoy extending two hundred miles east and west, and seventy-five miles north and south. He was kind, sympathetic, and unpretentious, and preached in a simple, sincere, understanding manner to these newly arrived immigrants who were so often confused and perplexed in isolation of this new and strange land. His gracious manner, pleasing voice, and warm personality endeared him to these people who yearned for the preaching and ministrations of the Lutheran church.. He was gratefully received in the widely scattered settlements. For twenty years Rev. Clausen, this man of ability and culture, used his talents and resouces to serve the people and the St. Ansgar community as their counselor, teacher, servant, legislator and pastor. In the fall of 1854 he had government surveyors plat the one hundred twenty acres he had set aside to be the site of St. Ansgar. He gave a block of land to the settlement for a city park, which is now named the Clausen Memorial Park with a suitable plaque honoring him. He was the first school teacher in the community, the first justice of peace, the first school fund commissioner for Mitchell County, (now called County Superintendent), a member of the Sixth General Assembly --representing six counties (this was the last General Assembly to meet at Iowa City), a chaplain in the Civil War, an Iowa Commissioner of Immigration for two terms as well as being a compelling leader in the early years of the Lutheran church in America in spite of heartaches, worries, and disappointments caused at times by his colleagues of the Norwegian Synod and the Conference. Rev. Clausen was married to Martha Frederikke Rasmusdatter in 1842, just before coming to Wisconsin. They had two sons; one died in infancy. Martha died in 1846 and Rev. Clausen married Bergetha Petersdatter Hjorth in 1847. They were the parents of four sons: Charles, Edward, Lauritz, Berger, an adopted daughter, Gunhild and son, Martin from Rev. Clausen's first marriage. Bergetha died in 1887 and Rev. Clausen in 1892. They are buried in Oakwood Cemetery, Austin, Minn.
Rev. Clausen is remembered with love and respect for his loyalty and unremitting love for the Norwegian people, whom he served so faithfully in so many ways. Today we give him our high esteem and everlasting gratitude for his constancy. Rev. C.L. Clausen, the founder of St. Ansgar, and of the Mitchell county for that matter, died near Seatle, Washington, last Saturday. His remains are now enroute for Austin. Rev. 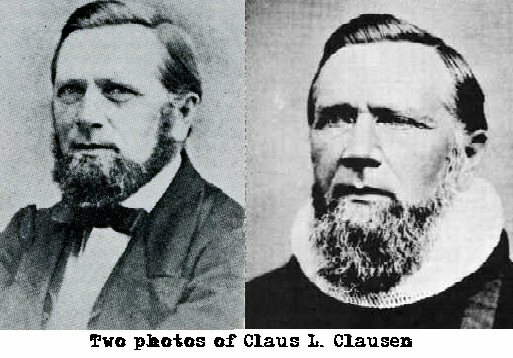 Clausen was born in November, 1820, consequently was just past 71 years of age. He came to Mitchell county forty years ago this coming summer and secured the land upon which this town now stands. An effort will be made to have his remains brought here for burial in which case a fine monument will be erected to his memory. Not St. Ansgar, but every town in Mitchell county should be interested in having the mortal remains of Rev. Clausen laid away in the town which he established in what was then a wilderness. Several from this place have gone to Austin to be present when the remains arrive.